I’ve been tinkering around with custom calendars for the past day, and come up with this 100% bubble built Date Range Picker that I would like to show you’s. I’m thinking about creating some tutorials for custom calendars, Leave a like if that interest you. i there im looking for a solution to extract data on information entered on any random day using date range picker and have it show in any group element, would you have any idea on how i can go aboutt it. So you would like to search your data base for data create or listed within two dates? i want to search data inputted on any random date, for example i want to be able to view data i inputted last week when i click that date. A new addition to the hello calendars family. Enquire and give our calendars a try below. Ever wanted to plan your bookings with ease. 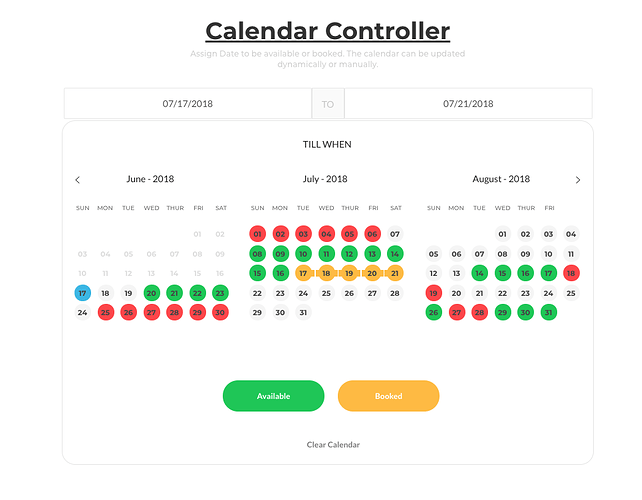 Our new Calendar Controller will do just the tick. Set your availability’s in style. Give it a test run here. Looking good - nice idea with the ‘Undo last dates’, just in-case of user error. Do you have a tutorial for the calendars by chance? Would love to mirror for a few apps I’ve got! @ItsJustBusiness I really like the calendar controller! Very nice. I’m currently working on the tutorials and hope to have one up within the next week. Thank you for this calendar, will try. 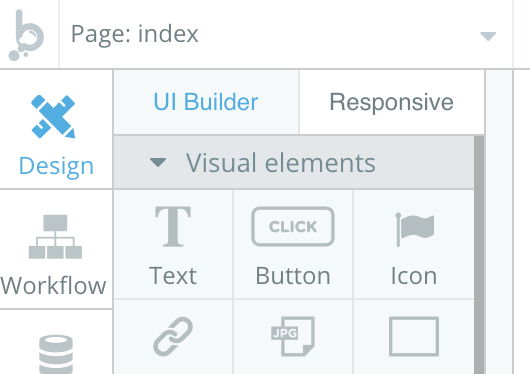 Here is the editor link so you can show your selfs around the inner workings. Just a quick update if anyone else is having similar issues…I found a fix. I think the issue is caused by the text of the date e.g. 22 being inside the group as when changing month (clicking the arrow to process the workflow of OffSetMonth +1 or -1) there is a slight lag, therefore the text element inside the group doesn’t quite catch up and hence will sometimes show the wrong date number. I’ve got past this issue by adding a transition to the repeating group when triggering the workflow for either next or past month using the Element workflow and Animate e.g. set Repeating Group to Fade. With this trick it then must give the date just enough time to catch up in the repeating group to display correctly, GIF below to demo. 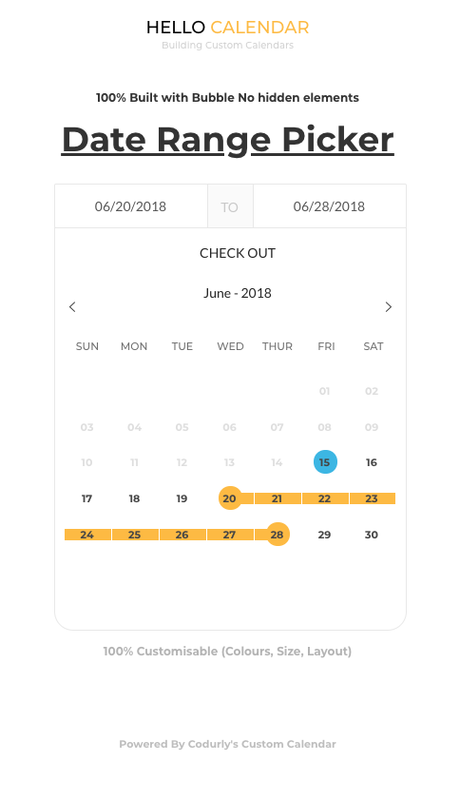 Also you could take the text element outside of the group and then copy over the conditions to the text element, but this doesn’t give you as much flexibility in styling with the conditions on the element, but will of course do the trick in providing the right date without the need for a transition. Yeah it was an odd one that at first caught my eye and was really bugging me. 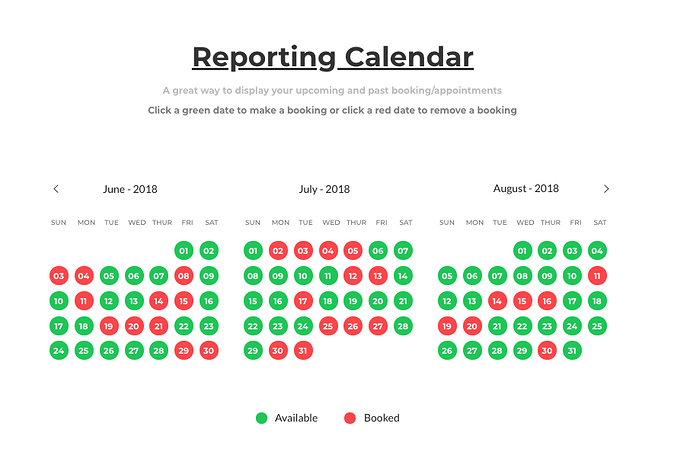 But after some tweaking it was somewhat evident there was some lag between the showing the next month and the rendering of the dates list into the repeating group. There maybe a better fix, but as mentioned for me the transition/animate effect or evading the text within the group seems to fix the issue. Its funny you say that, I checked your calendar app on PH to see if it might have any similar issue with that month specifically (Dec 2018) but as you’ve mentioned its heavily customised and working fine. Yeah, I’d never seen that behavior, even before I made a fairly major change to how I handle dates.